Mega Man X5, known as Rockman X5​ (ロックマンX5) in Japan, is a video game developed by Capcom. It is the fifth main game in the Mega Man X series. 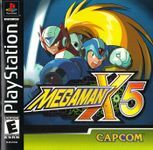 It was released in 2000 for the PlayStation, three years after Mega Man X4, and in 2002 for PC. It was re-released on January 10, 2006 as part of the Mega Man X Collection for the GameCube and PlayStation 2. X5 was developed by a different team than X4, and this is evident in the style of gameplay. The most prominent difference in this iteration is the time limit of 16 hours (though at points the game or manual claim 24 hours), until the space station Eurasia crashes into Earth. Every time the player enters a stage, one hour is expended. At any point between levels, the player has the option of firing the Enigma at the Eurasia. If the Enigma misses, then the player has the option of launching the shuttle. Whether the crash is prevented or not is determined by random chance. If the crash is not prevented, the course of the story is changed. Due to the nature of the storyline, there are multiple endings. Whether X or Zero is used to defeat the last boss also affects which ending is seen. The main gameplay remains the same. There are four armors for X—his Ultimate Armor, the upgraded armor from Mega Man X4, and two others that must be assembled from capsules. However, X cannot wear parts of these armors separately. X can also no longer shoot his buster through walls, and each character has the ability to duck. Zero is able to find and use the capsules. However, if Zero reaches the capsule that contains X's Ultimate Armor, Dr Light will offer the "Black Zero" Armor instead of the Ultimate Armor. Source: Wikipedia, Mega Man X5 , available under the CC-BY-SA License.